We were lost. I was sure of it. Up early and en route for our truffle hunting adventure, I had been assured by our guide that the trek from Rovinj to the small village of Vrh would take no more than an hour. We had GPS in our rental car so I was only a little worried about loosing our way. Blindly following technology we set off, only to find the instructions directing us off a main road onto a one-lane gravel path. We all exchanged nervous glances as Zach drove us through the narrow passage white-knuckled, trees scraping the sides of our car. Several turns, passes through small towns that were no where to be found on our map and many more one-lane gravel roads later, we realized that the GPS setting of ‘shortest route’ was indeed leading us in the correct direction… but ‘fastest route’ would prove to be a more practical, less stressful affair. Thankfully, when we pulled up to the clock tower in Vrh nearly 45 minutes late, our kind guide Zdenka of Istriana Travel was waiting for us, a wide smile spread across her face. I felt myself completely relax. 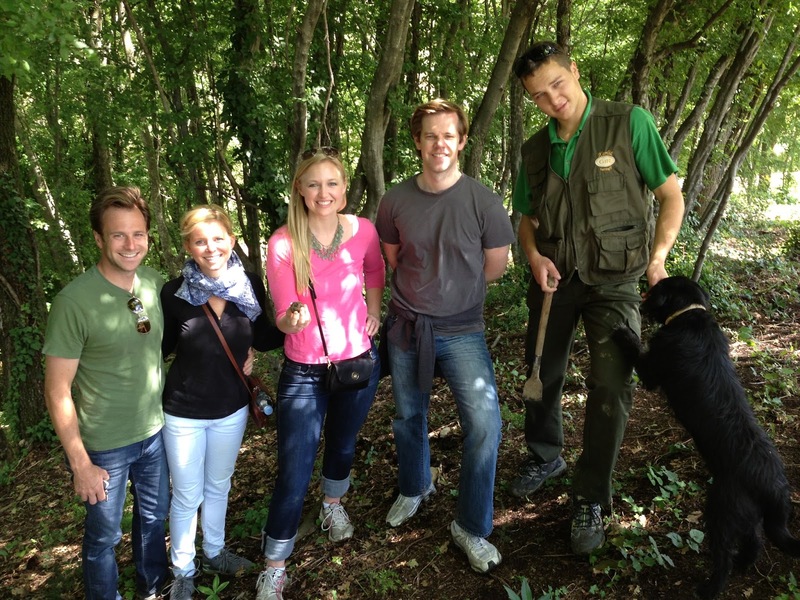 We weren’t going to miss our truffle hunt after all. 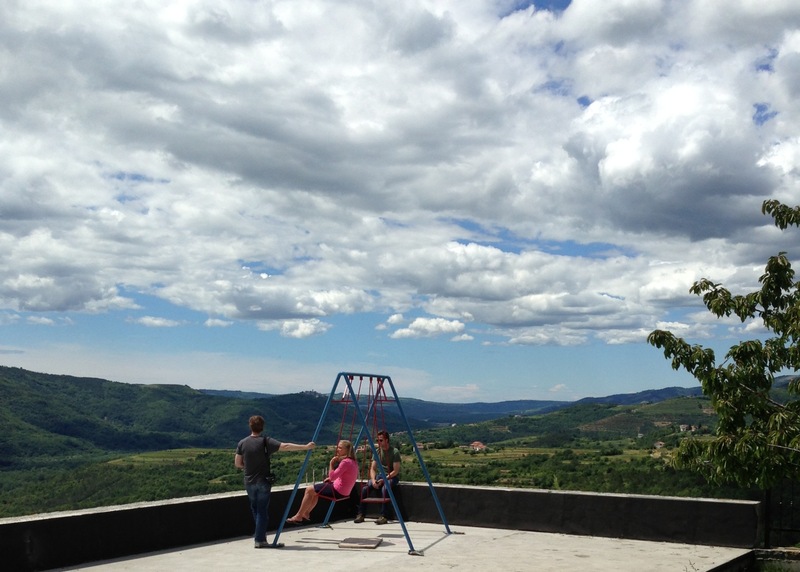 Zdenka led us from the clock tower down a hill, turning us away from the town to overlook an enormous valley, a patchwork quilt of vineyards, olive groves and forests filled with the ever elusive, ever luxurious truffle. We were now standing on the Karlic family’s estate, a home rich with history and built out of a love for this wild and revered mushroom. Welcomed with open arms, a sampling of grappa was offered, three different varieties, all house-made, all unique and delicious. We were quickly introduced to Blacky, one of the Karlic family’s most beloved and talented truffle-hunting dogs, and we set off into the forest, Blacky bounding ahead, knowing her mission and seemingly ecstatic to accomplish it. What followed was a 45 minute exploration of the muddy, rich forest floor of Istria, leaves and other brush creating a carpet of sorts over the ground, offering up the ideal environment for truffle growth. Our guide coaxed Blacky to keep her nose down and to sniff out our treasure. We turned up nothing but wet soil at first but then suddenly Blacky was digging, intensely focused on one spot in the earth and clawing away at the ground at a fevered pitch. We all hushed and rushed to her side. Blending in with the earth so well, it baffles me to think anyone ever discovered this jewel to begin with. I brushed my finger up against the bumpy surface of the mushroom and slowly pulled it away from the soil, lifting it out of the ground, to Blacky’s delight. We all laughed with excitement over our find while Blacky went straight for our guide’s pocket, confident that her prize had now been earned. Exuberant, we marched back to the house where a feast of truffle-studded delicacies awaited. Homemade truffle sausage, truffle-laden cheese and local honey with truffles were laid out before us, small slices of bread with a fresh truffle spread and one large slice of truffle on top rounding out our feast. The highlight of the day, and quite nearly our entire trip, was the omelette they crafted, blending farm fresh eggs with more fresh truffles than one will see in a lifetime, much less in one dish. Satiated and euphoric we sat on the ledge of the hill overlooking the forest and allowed the sun to beat down on our face. I hope this video offers you a taste of our adventure. I only wish I could somehow transmit the scent of the truffle through this post. It is all-encompasing and, once it grabs hold of you, there is no question as to why it has become the object of obsession and reverence. Our visit with the Karlic family left me fully addicted and I can’t wait for my next encounter with the truffle. This is beautifully written. I feel like I am actually there hunting for truffles with you. The food looks amazing as well!! Thanks for sharing. I can taste the omelette all over again just reading this. Delicious interpretation of our adventure! Most noted gastronomic delight – the Istrian truffles are considered more fragrant than those from Alba or Piedmont and present a massive appeal for local and international flocks of foodies. The ‘Days of Truffles’ festival takes place between early September and early November when the forests of Livade and Oprtalj come alive with hungry crowds of entrepreneurs led by expert guides called ’tartufalo’ and their specially trained dogs.